I wasn’t worried about choosing three words for 2015. Over the five years I’ve practiced this annual tradition I’ve learned to trust my three words will appear. And they inevitably do. In the weeks since, I’ve had a chance to appreciate the different ways in which these three words for 2015 can be meaningful. If you Google “do one thing” you’ll get a variety of results. Many have to do with a charitable appeal of some sort. Frequently, the Eleanor Roosevelt quote, “Do one thing that scares you every day” surfaces, too. The concept associated with my three words for 2015 that resonates most strongly for me right now is: you can do better work and get more done if you just do one thing at a time. This goes against everything we ever believed about multi-tasking. And boy, have I thought I had multi-tasking down! 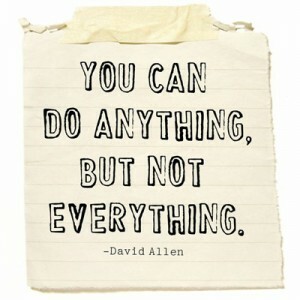 It can be really hard to accept that limiting yourself to doing one thing at a time gives better results, but it does. Scientific studies have indicated we experience a 20% loss in productivity just by switching from one task to another. This means instead of devoting 50-50 energy, a task only gets 40% of our potential. Juggle three tasks, and each one only gets 20% of our potential, because we’ve lost 20% switching two times, leaving only a total of 60% available. Yikes! No wonder we all feel so busy, and at the same time we’re getting nothing done! Have you ever actually tried to stop multi-tasking? Over the last few weeks, I’ve made a conscious effort to observe myself. I’d take mental note when I felt compelled to check for emails or just peek at Facebook while I was completing another project. It was hard to stop doing this! I got more and more upset when I realized how much I was self-sabotaging. We sabotage our productivity by trying to do too many things at once, but we also diminish our creativity and decision-making capabilities when more than one thing is on the table. Our brains clog. It gets so noisy in our heads we can’t hear ourselves thinking of solutions. Writing for Entrepreneur, James Clear cites a programmer from the University of North Carolina, Fred Stutzman, who was frustrated by distractions while working on his thesis. Stutzman went on to create some software to block his computer from letting him stray from a task for a certain period of time. If he wanted to divert from an application, he’d have to turn off his computer and reboot it. Perhaps you’ve downloaded Fred’s program: Freedom. Over half a million others have. Pete and I found this to be true when planning our travels for 2015. (And boy, do we have some exciting destinations to look forward to. Never in our wildest dreams!) During the beginning stages, we’d say “Oh, we could go here, go there, go everywhere.” And no plans got made. The inability to commit in the face of so much choice was stunning and frustrating. Only when our choices were narrowed by external factors could we focus. And the universe presented us with a fantastic itinerary that we never would have conjured up ourselves. Having a deadline with certain resources really helped: we had to get certain things booked. Perception of loss outweighs the false merit of too many options. The biggest consequence of indecision is that nothing happens. You can make something happen, on the other hand, if you just remember my three words and do one thing. James Clear says sometimes “what we need is a tunnel that can reduce our choices and send us in a focused direction.” Harness horses wearing blinders don’t veer. We’ve got a comprehensive strategic plan filled with objectives and tactics for 2015. The mere sight of it could produce overwhelm. The nice thing is each tactic in the plan can stand alone as long as I use my three words as a process mantra. How about you? 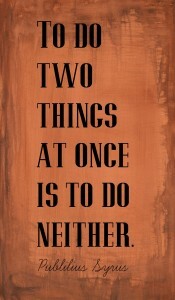 Could you commit to just do one thing given your current habits? Does the idea even appeal to you? 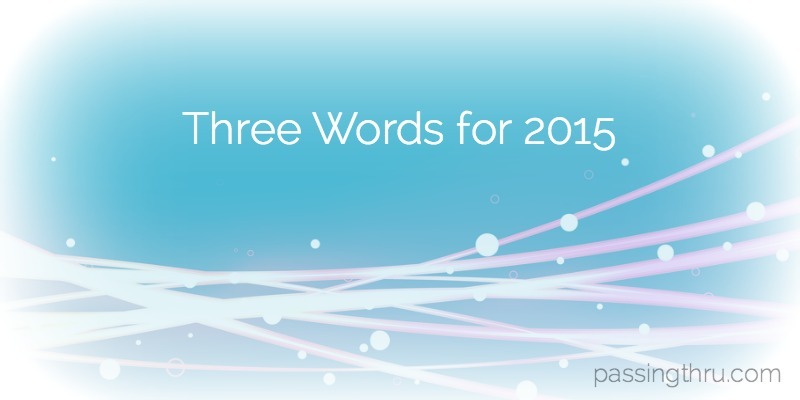 Do you make resolutions, set goals, or have you chosen three words for 2015 yourself? Let us know in the comments! Happy New Year! Wow, I multitask way too much! Staying focused on one thing will be something I will try to do. I really like your tradition too. Very creative! Happy New Year Vicky and Buddy – Thank you so much. I loved your reflections post. Here’s to a great 2015! nice post. I have spent most of my life multi-tasking and know the dangers, plus the fact that nothing is done at 100%. I practiced that with my children, making them narrow down their activities so they could give their all, when their friends were running around with 10 iron in the fire and not excelling at anything. However, I never much thought of reducing my own engagements to concentrate my efforts more on only one thing. Thank you for bringing this to our attention, especially with New Years resolution time being so close, so maybe I can focus more efforts into the project at hand and not all the distractions surrounding. Best wishes for a happy & healthy 2015. Hi Melody – You reminded me that like you, I limited my kids’ activities. As a single mom, it was hard enough to get them where they needed to be, sometimes in two different places at once. If it’s good for them, it has to be good for us, right? Absolutely love your three words concept for the year. We try to pick one word and it’s tough to choose. Multitasking is discussed so frequently these days everybody wants to be good at it. As you and your sources accurately point out no one is or really should be. I’m down to two words for 2015 – slow down. We have the opportunity to see and experience so many things but rarely have the time to enjoy them fully. This year I intend to do just that. Wish me luck. Wow Betsy, that is the most potent piece of advice I’ve read this year. Definitely inspiring, and I know it’s one of my problem areas, I start with one thing and end up getting off track so quickly. Going to totally focus on doing one thing and getting it right! No more headless chicken for me. We are all guilty of multi tasking, the thought that we we start different things at a time we assume we get more things done….. this is a good read. Hi Anne – Yeah, it seems like it would be a logical assumption. And, even though quality may suffer, I think we rationalize by saying completion to a standard that is “good enough” is okay. I’m undecided on that. Some less important things, yes. But the stuff we care about? Going to try to improve. Thanks for your comment. I love multi-tasking, but agree that it doesn’t leave you the most productive. Great reflection!